This is my third of three posts on a trip to the Central African Republic (CAR) in December 2017. The first part dealt with the (extensive) planning for the trip and my days in Bangui at the start of the trip. The second part covered the remainder of my trip, mostly my week at Sangha Lodge in the rainforest of Dzanga-Sangha National Park. This, last of my CAR posts, is for the intense wild animal-seekers out there. It’s a list of all the mammals, birds, reptiles and amphibians I came across during my trip and any relevant notes about where they were seen and suggestions on how others might see them. I’m also including animals that I haven’t been able to properly identify, in hopes that somebody reading this might have some insight as to what these animals could be. I identified mammals based on Kingdon’s Mammals of African, second edition. After my trip I confirmed the IDs from my notes and pictures using the Handbook of the Mammals of the World. I assigned the animals I saw to subspecies based purely on range maps. 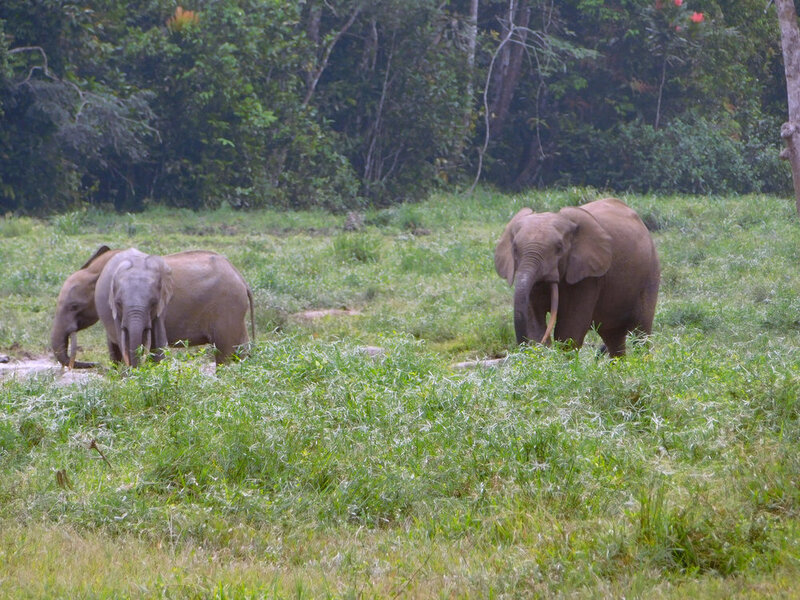 African Forest Elephants digging for mud in Bai Hokou. African Forest Elephant (Loxodonta cyclotis) - Practically guaranteed at Dzanga Bai, also frequent at other bais, like Bai Hokou. Otherwise quite hard to see, even though they are present everywhere. Southern Needle-clawed Galago (Euoticus elegantulus) - Seemed relatively common on the trails around Sangha Lodge at night. I saw three during my time there. Demidoff’s and Thomas’s galagos are almost impossible to tell apart in the field based on physical appearance, from what I’ve heard. However, apparently they can be relatively reliably distinguished by behaviour (and by call, though I didn’t hear them make any sounds). Demidoff’s Dwarf Galago (Galagoides demidovii anomurus) - Sangha Lodge’s owner, Rod, said these are not easy to see. I assigned one galago I saw to this species because it was foraging low in the understory of the forest, at about my eye level, and was moving by scrambling through the vine thickets. Thomas’s Galago (Galagoides thomasi) - I assigned the rest of the galagos I saw to this species because they were high up in the forest canopy and because they would move by running along branches lengthwise and leaping from tree to tree. If I am correct in my IDs, these are fairly easy to see at night on the trails around Sangha Lodge, though you’ll need a good pair of binoculars to see anything beyond their intense eyeshine. Milne-Edward’s Potto (Perodicticus edwardsi) - Fairly common on the trails around Sangha Lodge at night. Moustached Monkey (Cercopithicus cephus cephus) - Common, I saw them in several places but most easily in the forest around the visitor’s centre in Dzanga-Sangha NP. Putty-nosed Monkey (Cercopithicus nictitans nictitans) - Common and easily seen around Sangha Lodge. Crowned Monkey (Cercopithicus pogonias grayi) - Apparently common around Sangha Lodge, but I only managed to spot them once, in a mixed group with putty-nosed monkeys. Grey-cheeked Mangabey (Lophocebus albigena) - I saw them one morning on the hike into Dzanga Bai. A blurry, heavily cropped picture of a western guereza at Dzanga Bai. Western Guereza (Colobus guereza occidentalis) - Seen foraging on the ground at Dzanga Bai. Mongambe, the silverback of one of the two habituated gorilla groups tourists can visit, near Bai Hokou. Western Lowland Gorilla (Gorilla gorilla gorilla) - Guided tours will lead you to one of two habituated groups, so sightings are almost guaranteed. I also saw an unhabituated silverback on one of the mud tracks in Dzanga-Sangha NP, which was one of the most spectacular animal sightings of my life. They’re also occasionally seen foraging in Bai Hokou. I had a particularly hard time identifying the squirrels I saw, and I saw lots! I saw at least one individual of each of the following five species well enough to confidently ID them to species, but most that I saw went unidentified. Striped Ground Squirrel (Euxerus erythropus limitaneus) - One seen on the roadside passing though a grassy area on the outskirts of Bayanga Village. Thomas’s Rope Squirrel (Funisciurus anerythrus mystax) - Seen around Sangha Lodge. Ribboned Rope Squirrel (Funisciurus lemniscates mayumbicus) - Seen around Sangha Lodge. Red-legged Sun-squirrel (Heliosciurus rufobrachium) - Seen at Dzangha Bai. 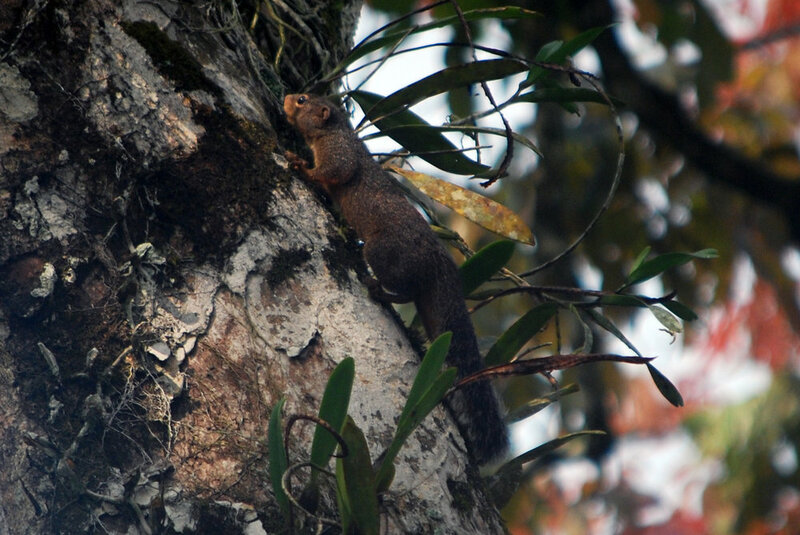 Forest Giant Squirrel (Protoxerus stangeri eborivorus) - One seen at the visitor’s centre in Dzanga-Sangha NP. Before arriving at Sangha Lodge I’d never heard of anomalures. When I left I’d seen half the world’s species! It took us forever to identify this Beecroft’s anomalure. Beecroft’s Anomalure (Anomalurus beecrofti) - One seen at night on the trails around Sangha Lodge. Lord Derby’s Anomalure (Anomalurus derbianus) - Seen reliably inside a hollow tree on the Sangha Lodge property. Lesser Cane Rat (Thryonomys gregorianus) - One seen running across the road on the outskirts of Bayanga at sunset. As with the squirrels, most of the bats I saw went unidentified. Most were little more than shadowy blurs silhouetted against the dusk. Pel's Pouched Bat (Saccolaimus peli) - These massive bats were easy to see around Sangha Lodge, particularly flying over the river. They are identifiable by their huge size. Intermediate Slit-faced Bat (Nycteris intermedia) - The hollow tree that houses the Lord Derby’s anomalure is also home to at least two kinds of bat. I was able to identify one of them as slit-faced bats, and I’ve called them N. intermedia based on Vladimir Dinnet’s notes. Pangi, one of the two habituated long-tailed pangolins living around Sangha Lodge. There are much better pictures of her elsewhere on the Internet. Long-tailed Pangolin (Manis tetradactyla) - Easily seen at Sangha Lodge by joining the trackers that follow habituated individuals from sunrise to sunset. Otherwise practically impossible to see. 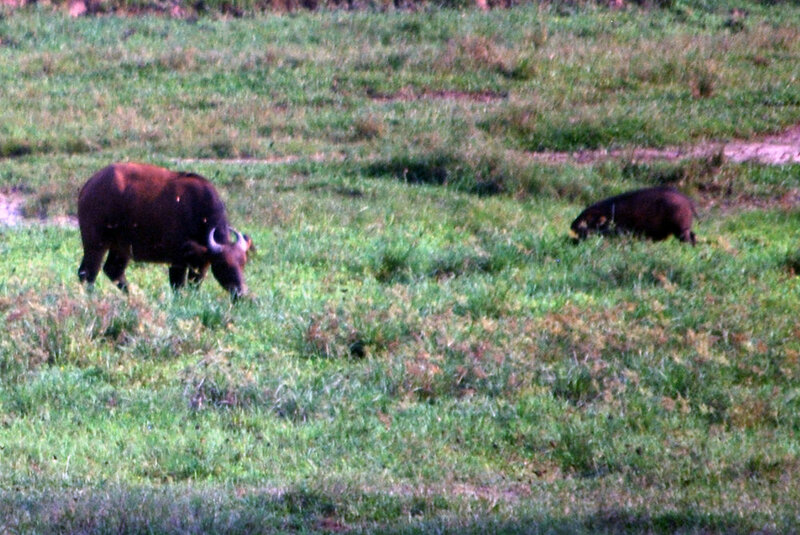 Forest buffalo (left) and giant forest hog (right) hanging out together at Dzanga Bai. Giant Forest Hog (Hylochoerus meinertzhageni rimator) - Regularly seen at Dzanga Bai. Forest Buffalo (Syncerus nanus) - Reliable at Dzanga Bai. Bongo (Tragelaphus eurycerus) - Occasionally makes an appearance at Dzanga Bai, making that the best place in the world to see them. Western Sitatunga at Bai Hokou. Western Sitatunga (Tragelaphus gratus) - Occasionally seen at Bai Hokou. I think these three pictures are of a red-legged sun squirrel. Can anyone confirm or correct me? 2. The hollow tree where the Lord Derby’s anomalure is found, I identified two species of bats. This was quite challenging, I was literally going back-and-forth between looking straight up with my binoculars and reading through Kingdon’s guide. I identified two bats down to genus: the slit-faced bats mentioned above and woolly bats (Kerivoula sp.). Unfortunately Vladimir Dinnet does not list a woolly bat species as occurring inside that tree. Does anyone know what kind(s) of woolly bat roosts in there? Tree Hyrax - Their extremely loud calls were heard nightly around Sangha Lodge, sometimes very close to the trails. I think I could have found them if I had known what I was looking for, I thought I was looking for some kind of nocturnal bird! Agile Mangabey - Usually easy to see as there is a habituated group at Bai Hokou but unfortunately when I was there the trackers were on strike. De Brazza’s Monkey - Apparently occasionally seen in the swampy area near Sangha Lodge but I didn’t get enough time to properly explore this area in the daytime. Brush-tailed Porcupine - There is a cave where they live not far from Sangha Lodge, but when we went they were very skittish and ran too deep into the cave for us to see. They can also be reliably seen by going hunting with the Ba’aka. Tree Pangolin - Apparently regular on the trails around Sangha Lodge at night, though I think Rod might be a little over optimistic (he said they’re seen approx. once per four night walks). Red River Hog - My favourite pig, I was really hoping to see them. They’re regular at Dzanga Bai, so I was just unlucky. I identified birds almost exclusively by sight, using the second edition of the Birds of Western Africa. I’m just not good enough at African bird calls to rely on them. However, Rod Cassidy, the owner of Sangha Lodge, was a professional birding guide in Africa before buying the lodge, so I was able to rely on him for help with some hard-to-ID birds. He also loaned me his Swarovski telescope to use at Dzanga Bai, which very much came in handy. My bird list is here. It is 173 species long, and I don’t think it’s worth reposting. Instead, I’m just going to mention some highlights. Also, I should note that my list may not be complete, I think I forgot to write down some of the common and/or introduced species I’d seen previously. Plumed Guineafowl (Guttera plumifera) - Seen with Rod’s help on the trails at Sangha Lodge. Yellow-throated Cuckoo (Chrysococcyx flaviguralis) - Not an easy bird to see, Rod help me track down one that was calling around Sangha Lodge early one morning. Black Spinetail (Telacanthura melanopygia) - The diversity of spinetails around Sangha Lodge makes identification a challenge; I found four species on my trip, of which this is the least reported (according to eBird). Forbes’s Plover (Charadrius forbesi) - A Central and West African specialty, these were common at Dzanga Bai. There were many other waders at Dzanga Bai as well, a good telescope is necessary if you want to identify them. Dwarf Bittern (Ixobrychus sturmii) - One seen at Dzanga Bai at the edge of the forest. Black Goshawk (Accipiter melanoleucus) - A spectacular bird to see emerge from the forest at Dzanga Bai. Dark Chanting-goshawk (Melierax metabates), Bataleur (Terathopius ecaudatus), Red-necked Buzzard (Buteo auguralis) - Three spectacular African raptors all seen riding the thermals from the road to Lac des Crocodiles. Fraser’s Eagle-owl (Bubo poensis) - Rod found one at Sangha Lodge after dinner one evening. Red-billed and Black Dwarf Hornbills (Lophoceros camurus and Horizocerus hartlaubi) - Both dwarf hornbills are rather difficult to see, but can be spotted in the forest canopy around Sangha Lodge. Black-and-white Casqued Hornbill (Bycanistes subcylindricus) - Rod says he doesn’t think these are present in the area, but I swear I saw one - the diagnostic black-and-white undertail pattern in particular - fly across the river during our river cruise. Peregrine Falcon (Falco peregrinus) - Despite seeing this bird regularly in all my hometowns (Toronto, Montreal and Canberra), I was extremely pleased to see a Sky Ferrari perched on the cell tower in downtown Bangui. Gray Parrot (Psittacus erithacus) - My #2 most wanted bird of the trip, they were so common at Sangha Lodge and around Dzanga-Sangha NP that I could have gotten sick of them if they weren’t so wonderful. The palm wine boat tour is particularly good for seeing them in large, riotous flocks. Red-eyed Puffback (Dryoscopus senegalensis) - A particularly hard rainforest bird to see, I only saw it once, at Dzanga Bai. Black -headed x African Paradise-flycatcher (Terpsiphone rufiventer x viridis) - While hanging around Bai Hokou village, I saw what looked like a black-headed paradise-flycatcher, except it had black underparts and white tail streamers of intermediate length. What a weird bird. White-bearded Greenbul (Criniger ndussumensis) - I saw this around Sangha Lodge, and was able to identify it to species only with Rod’s help. Lesser Bristlebill (Bleda notatus) - I was lucky in finding an army ant swarm while wandering the Sangha Lodge trails and, though the experience was stressful for trying to avoid being encircled by the ants, it was great for birding those understory skulkers that are otherwise quite difficult to get a look at. Xavier’s Greenbul (Phyllastrephus xavieri) - I saw this greenbul only once, birding around the Bai Hokou village. Green-backed Eremomela (Eremomela canescens) - This seldom-reported bird seems pretty easy to see on the road to Lac des Crocodiles. Gosling’s Apalis (Apalis goslingi) - This Central African specialty was easy to see at Sangha Lodge. Yellow-footed Flycatcher (Muscicapa sethsmithi) - This did not seem like an easy bird to see, but I found one extremely confiding individual hanging around the Bai Hokou village. This bird was seen and photographed at Dzanga Bai. Yes, this is the best (i.e. only) picture we managed to get. Can anyone identify it from this? Red-necked Picathartes - I was sad to have missed my #1 target bird. Rod has a reliable spot for them, but unfortunately a poacher had camped there recently (the remnants of his fire pit were still very evident) and there were no birds to be found. We did see their weird mud nests. White-collared Starling - Rod suggested that the road to Lac des Crocodiles is a good place to look for this species because previous groups had found them there. Pennant-winged and Standard-winged Nightjars - Rod said that these can be found hawking over and around the airstrip at Bayanga, but we didn’t manage to arrange a night trip there. Also, the road to Lac des Crocodiles is almost guaranteed to have them, but I don’t think driving this road at night is a good idea in the current security situation. Greater Painted-snipe - I was convinced that if I scanned Dzanga Bai long enough and hard enough with the telescope I would find one, but I never did. Reptiles were the hardest to identify because (1) there is a huge lack of knowledge as to what reptiles live in Central Africa, (2) they are extremely diverse (particularly certain groups of lizards and snakes), and (3) diagnostic differences between species can be subtle. Luckily reptiles have long been my passion, and I can identify almost all reptiles to family on sight, most reptiles to genus on sight, and for the easier groups (monitor lizards, boids, crocodilians, etc) I can identify them to species on sight. 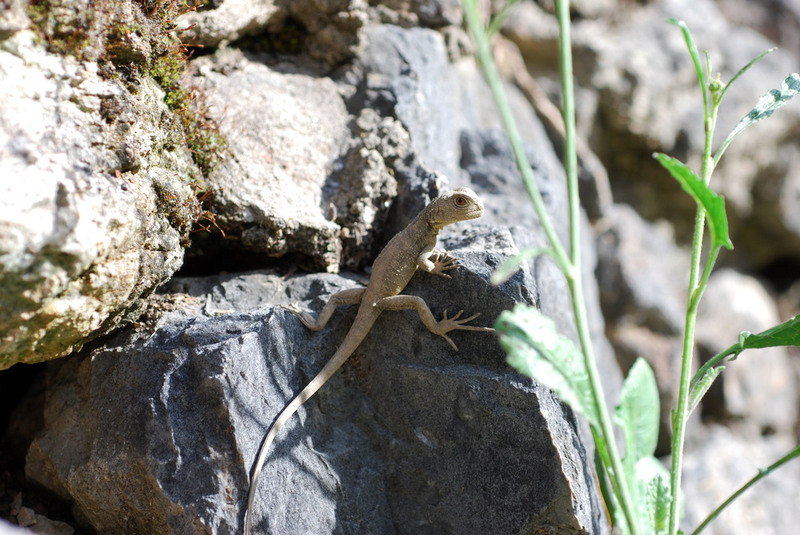 However, for a lot of the small, skittish lizards, it just wasn’t possible to identify them on my trip. I took pictures of them if I could get my camera out and focussed before they ran away, and others took notes on their appearance as best I could. Once I got home, I used the primary (scientific) literature to figure out what species in that family or genus could be present in CAR, and then how to tell those species apart. My main source of information for what reptiles are present in CAR was Chirio & Ineich, 2006. A young Central African dwarf crocodile in the swamps near Sangha Lodge. Central African Dwarf Crocodile (Osteolaemus teraspis) - I saw a young one spotlighting in the swamps on my first night at Sangha Lodge. Rod doubted that I’d find one, and I wasn’t able to find it again on subsequent nights despite intensive searching, so I think they are pretty rare in the area and I was extremely lucky. A young sacred crocodile at Lac des Crocodiles near Boali Falls. 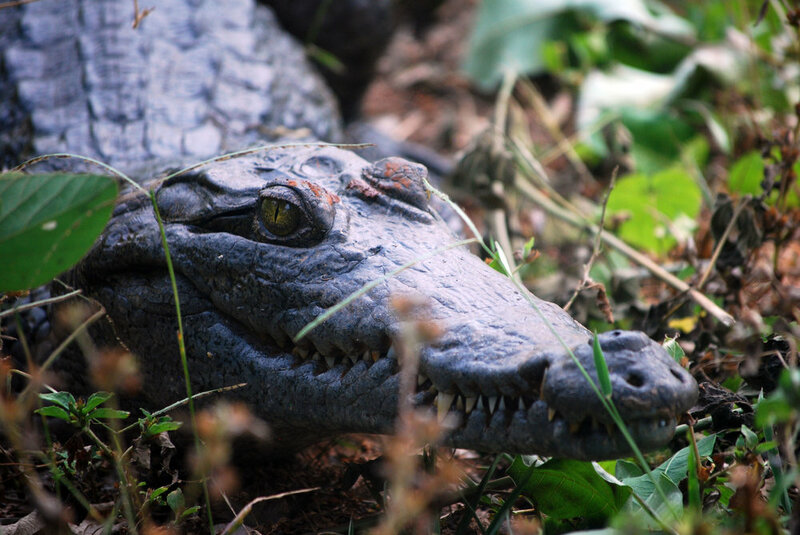 Sacred Crocodile (Crocodylus suchus) - A young one was lured out of the Lac des Crocodiles with the promise of a live chicken, however a hive of angry bees came to the chicken’s rescue. The poor croc retreated back to its lake unfed as we all ran off screaming. A Calabar burrowing python found at night near the Picathartes waterfall, Sangha Lodge. Calabar Burrowing Python (Calabria reinhardtii) - One found at night spotlighting below the picathartes nesting site. My guide completely freaked out when I picked it up. He was new, very keen to make a good impression (which he did), and thought he was watching his great opportunity disappear before his eyes because who would hire him again when his first tourist committed suicide by snake? After I explained (repeatedly and at length) that this particular snake was not dangerous, he eventually asked to hold it. Jameson’s Mamba (Dendroaspis jamesoni jamesoni) - There aren’t many wild animal experiences I treasure more than watching a two-meter-long, bright yellow mamba move effortlessly from a sunny patch on the rainforest floor up a palm tree and into the safety of its crown of thorny fronds. The mamba made no hurry and kept its head elevated and eye on me the whole time. I would have walked right by it had a squirrel not been alarm-calling at it, and even then I spent the first few minutes trying to ID the squirrel before I thought to try and figure out what had got the squirrel so worried. How many other amazing, fully exposed but well-camouflaged animals did I walk right past? A beautifully coloured male African five-lined skink at Boali Falls. A baby African five-lined skink with a beautiful blue tail. African Five-lined Skink (Trachylepis quinquetaeniata) - Common around man-made structures at Boali Falls and Lac des Crocodiles. A speckle-lipped skink basking on the deck at Sangha Lodge. Speckle-lipped Skink (Trachylepis maculilabris) - Common around Sangha Lodge. A Makolowodé’s skink hanging above the door to my cabin. I took a bunch of pictures of this guy, and he never moved. Later, I realized he was dead. Makolowodé’s Skink (Trachylepis makolowodei) - Common around Sangha Lodge. 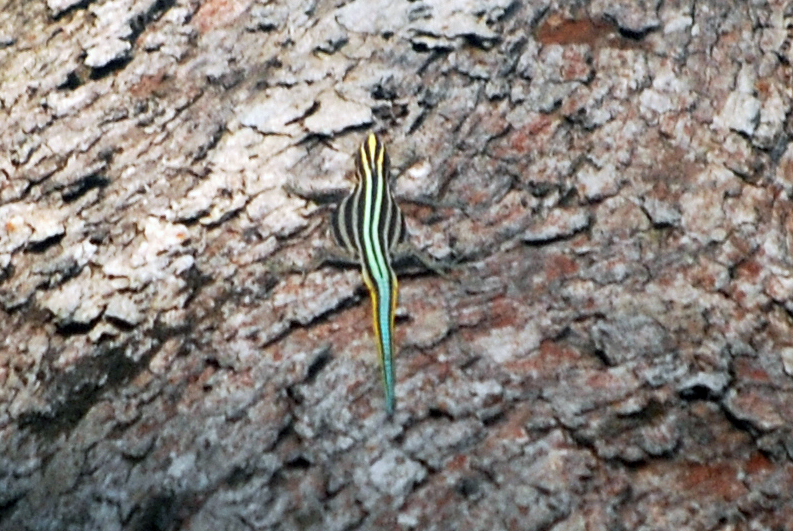 A Benoue agama near Boali Falls. Benoue Agama (Agama dorian) - Common around man-made structures at Boali Falls and Lac des Crocodiles. A gorgeous male red-headed agama. Red-headed Agama (Agama lebertoni) - The Agama agama-group species in the area, these were surprisingly uncommon. Usually they are abundant around human habitation, but I only saw them around the Mausoleum of Ange-Félix Patassé, just outside of Bangui. Moreau’s tropical house gecko in my cabin at Sangha Lodge. Moreau’s Tropical House Gecko (Hemidactylus mabouia) - Seen on the interior walls of my cottage at Sangha Lodge, as well as the dining hall. A coalescent house gecko in my cabin at Sangha Lodge. Coalescent House Gecko (Hemidactylus coalescens) - Common both in the buildings at Sangha Lodge, and around the bases of trees in the forest. The one picture I was able to get of the sawtail lizard before it took off. Sawtail Lizard (Holaspis guentheri) - I saw this gorgeous lizard on a tree limb beside the observation hide at Dzanga Bai. That was the only one I ever saw, so I suspect they aren’t easy to find unless you can get up high. Ornate Monitor (Varanus ornatus) - Rod was surprised when I told him on my last day that I had yet to see one. He said he frequently sees them wandering around the camp. I made a concerted effort to find on that morning, and finally came across a baby on the bank of the river across from the camp. It was gorgeous, and well worth the effort. 1. This gorgeous agama was hanging around on the tree by the Dzanga Bai elevated hide, and I have no idea what it is. Not only is its colour scheme not one I’ve seen described anywhere for any African agamid, but something about this individual says “female” to me, which would make its beautiful colours even more unusual. If you know what it is, please let me know! 2. I chased this agamid around my cabin at Sangha Lodge trying to get decent pictures. Something about this one makes me think it’s a male, but I still have no idea what species it could be. Central African Slender-snouted Crocodile - Rod says these have been hunted out from the area, but the guides in the Dzanga-Sangha NP were familiar with it. It might be worth trying to hire a Ba’aka guide to see if they can take to you a good spot for them. Gaboon and Rhinoceros Vipers - I borrowed a rake and tried raking through leaves at the bottom of a pit with no luck. Rod says he’s only seen them two ways: when they’re swimming in the river or fleeing army ants. I suspect they aren’t rare, but the quality of their camouflage and their habit of not moving make them almost impossible to find. Broadley’s and Variable Bush Vipers - Both these spectacular snakes should be present in the rainforest of southwest CAR. Spotlighting at night is probably the best way to find them (along with luck) but I didn’t come across any - and I spotlighted quite a bit! Conrau’s Dwarf Gecko - These tiny but spectacularly coloured gecko are around Sangha Lodge, I’m sure. They prefer dense vegetation in sunny spots in the forest. I’ll have to look harder next time. Savannah Monitor - I’ve got no idea what kind of hunting pressure they might be under, but they should be present in the savannah mosaic around Lac des Crocodiles. It’d be worth wandering around the area, or at least keeping an eye out while birding. Cameroon Stumptail Chameleon - I would LOVE to see a species of dwarf chameleon. I suspect find it is a matter of keeping a close eye on the ground while walking along rainforest trails. Although the data on amphibian diversity in Central Africa is just as terrible as the data on reptiles, two things made the amphibians easier to identify. First, their diversity is a heck of a lot lower, so the number of species that could possibly be present is less daunting. Second, an academic, David Modry, had recently done a survey of frogs at Sangha Lodge, and left behind a picture book of all the species they found. This was very useful. Unfortunately the data doesn’t seem to have made it into any publication yet. Greshoff’s Wax Frog (Cryptothylax greshoffi) - Common on the trails around Sangha Lodge at night. White-lipped Frog (Amnirana albolabris) - Common in the swamps near Sangha Lodge at night. Perret’s Grassland Frog (Ptychadena perreti) - Common in the grassy areas of Bai Hokou. Benito River Night Frog (Astylosternus batesi) - Not easy to find. I found a couple in the creek that flows down from the Picathartes nesting site. Buea Screeching Frog (Arthroleptis variabilis) - We managed to find a couple spotlighting at night on the trails around Sangha Lodge. Eared River Frog (Phrynobatrachus auritus) - A few individuals found in the swamps near Sangha Lodge. Oban Toad (Sclerophrys camerunensis) - This human-associated species is relatively easy to find at night around the Sangha Lodge buildings. 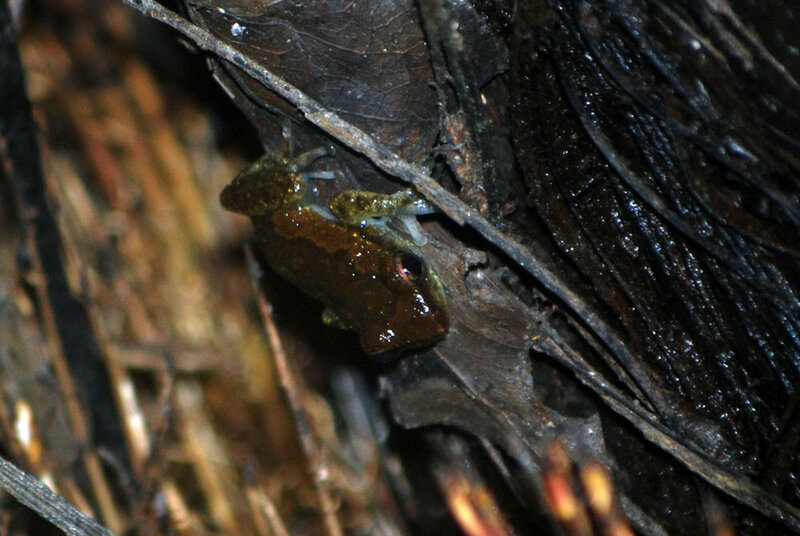 Central African clawed frog (Xenopus power) - This, the northernmost of the four species that Xenopus laevis was split into, was common in the swamps around Sangha Lodge at night. This was surprising because it is not included in David Modry’s picture book. Maybe its presence is seasonal? 1. I think this is just a weakly patterned eared river frog. Any other opinions? 2. I’m pretty sure this is Hyperolius brachiofasciatus based on the description in AmphibiaWeb, but identifying newly-metamorphosed froglets like this one is quite difficult. Does anyone have any insight? 4. David Modry has this listed in his book as Hyperolius sp. Anyone know if it’s been described? Congo caecilian - I have never seen any kind of caecilian in the wild. This terrestrial species should be pretty common in the rainforest, but I suspect we didn’t get enough rain when I was there to bring them out of their burrows. Bolifamba Reed Frog - This spectacularly coloured frog reaches its westernmost distribution in southwester CAR. Accra Snake-necked Frog - Another spectacularly coloured frog, this one found in dryer savannah regions. Lac des Crocodiles seems like a good place to look for them, but you’d have to be there during the rains. Cameroon Toad - Among the most beautiful of toads, this species is found in rainforests in the vicinity of large rivers, so Sangha Lodge seems like the perfect place to go looking for them! Maybe I have to spotlight more along the river’s edge, as opposed to in the forests and swamps. My PhD project – studying brain variation between lizard species in Australia – involved a lot of driving around Australia, gathering up lizards. As someone who loves to travel, particularly to wilderness regions, this was a very lucky gig for me. Most neuroscientists never get to work in the great outdoors, doing what biologists call “field work”. The time I spent in outback Australia I will never forget – and I am incredibly nostalgic for. However, while I loved being “in the field”, I don’t want to be a “field biologist”, that is, someone who gathers data out in nature and uses that data to test hypotheses. The questions that interest me most are questions of brain structure and function, and these are not the kinds of things field biologists generally study. Even when I did field work I was never really a field biologist; I brought the lizards back to the lab, and only then did I collect data from them. As a postdoc I’m still studying the questions that interest me most, but I’m doing it in a more conventional way, and in a more conventional neuroscience lab. That means, instead of driving out to remote areas and spending months catching the animals whose brains I would like to study, I now fill out an online request form and send it to a laboratory-grade animal supplier. The animals are usually delivered within 24 hours. A much more civilized system, to be sure, but orders of magnitude less fun. I now find myself just as intellectually satisfied as I was during my PhD, but with significantly itchier feet, to the extent that the ads showing up in my Facebook feed are almost entirely travel-related. No wonder people find Facebook depressing. In fact, I found life so depressing early on in my postdoc that I made a decision to spend a larger portion of my budget on personal travel, as a way of filling the void left by the absence of fieldwork. That is how, this past Christmas, I ended up spending by far the most money I have spent on anything, ever, on an animal-finding trip to the Central African Republic. I saw an ad on Twitter looking for volunteers to work at a lodge in the rainforest of southwest Central African Republic (CAR for short), doing, among other things, research on wild pangolins. As far as I knew there was no place in the world where wild pangolins could be seen reliably, and yet here was Sangha Lodge, looking for people to go and hang out with them! Now I was not – and am not – in a position to uproot my life to go live in the African jungle, as tempting as that prospect may be. I did, however, immediately e-mail the lodge to inquire about visiting as a tourist. Arranging to visit as a tourist turned out to be quite easy; the lodge runs periodic “organized tours”, which are more organized plane-sharing than anything else. Since most independent travellers can’t afford the very expensive charter flight that is the only way to get to the lodge, Sangha Lodge organizes for people to come at the same time, making the charter affordable. One of these tours happened to fit perfectly into my schedule. Arranging my life for a visit to CAR was another matter, though. CAR is not a safe place, by any stretch of the imagination. It is desperately poor and subject to ethnic, religious, and greed-based violence (and, if you ask me, the former two are just the latter in disguise). The travel warnings from places like Canada, the United States, Britain and Australia are the stuff of nightmares. My family read these warnings and freaked right out. My family is also relatively well connected and resourceful, and they picked up their phones. They got in contact with people like the Canadian high commissioner for CAR, the UNHCR representative for CAR, and a former Australian diplomat who had visited CAR. All very senior people, well informed and knowledgeable. They all had the same terrifying story to tell as the official travel warnings, and I came under intense pressure, up until the day I left, to abandon my trip. In my opinion official travel warnings tend to be exaggerated and can be hyperbolic verging on paranoid (not unlike the safety regulations dreamt up by universities). As for the officials, all the people my family talked to had two things in common: (1) they were all senior authority figures and (2) none of them were in CAR or had spent time there recently. With respect to (1), people in high places tend to be very risk averse because, for example, the Canadian high commissioner would get in a lot of trouble if he said anything that strayed from Canada’s official advice on visiting CAR, especially if something were to happen to me. This is not to say that I was determined to visit CAR no matter what, but just that I wanted to make up my own mind. I did my research by looking up news stories (particularly those published by African outlets), reading online trip reports from people who had visited Sangha Lodge and/or travelled through CAR, and ultimately getting in touch with people living and working in CAR, where there is a large United Nations peacekeeping and development presence. The picture these sources paint is not necessarily different from the official one, as CAR is indeed poor and plagued by violence, but it is a tapestry. Parts of CAR are far too dangerous to visit, but other parts are not. For example, parts of the capital, Bangui, are controlled by the UN, and are relatively calm. The part of CAR where Sangha Lodge is located, in the far southwest corner, has never seen violence, not even during the height of the civil war in 2012. I am being honest here about the risks – visiting CAR is not like visiting Italy, or even Tanzania. I would not land at the airport without a fixer waiting for me and a meticulously pre-arranged itinerary. But with these things in hand I decided, and I remain convinced, that it is safe to visit CAR under the auspices of Sangha Lodge. I mentioned having a “fixer” waiting at the airport. A fixer is someone who makes sure things run smoothly in places where there are “unofficial fees” for transiting through places like airports and checkpoints. In CAR you must know when and how to bribe your way along, or else you can find yourself in a lot of confusing trouble. (I feel compelled to note that the people demanding bribes in these situations are relatively low-level government employees and it is likely that they only rarely and sporadically get paid, if at all. Demanding bribes is probably their only way of keeping food on their tables). Sangha employs a fixer, William, who managed the lodge until moving to Bangui so that his kids could go to school there. The whole thing works relatively efficiently – if you know the system. Bangui M’Poko International Airport is not very well connected. There are no daily flights anywhere, but there are several flights a week to Casablanca, Paris, and Nairobi. Sangha’s tours are timed to the Nairobi flights, so if you fly into Bangui via Nairobi you wouldn’t have to leave the airport. However, my trip took me to Bangui via Paris, so I ended up having time in Bangui on either end of the tour. This was perfect for me as I was quite keen to see the area, and through Sangha I arranged to hire William as a guide for my days in Bangui. Hotel accommodation in Bangui is neither plentiful nor cheap. A friend of mine in Montreal put me in contact with his friends in Bangui, and when I asked them for accommodation advice they promptly invited me to stay in their guest bedroom. This was extraordinarily kind of them as they had never met me, and in return I brought them as much maple syrup as I could carry. They lived in the Skaiky Building, the tallest building in Bangui (at, if I remember correctly, 13 floors), and I had amazing views of Bangui, the Obangu River, and across the river to the Democratic Republic of Congo. The view over Bangui from my host's balcony in the Skaiky Building. I spotted a peregrine falcon perched on the cell tower to the center-right. The view from the Skaiky Building over the Bangui River. The opposite bank is a different country, the Democratic Republic of Congo. The haze visible in this picture (and, really, all the pictures) is not pollution but a dust cloud that seasonally blows off the Sahara Desert and is important for fertilizing the rainforest. On my way to Sangha I had a spare day in Bangui, and I arranged with William to see the one Bangui-area tourist attraction I had been able to find on the internet – Boali Falls. The falls, about an hour north of the city, are impressive in the sense that they are big and loud. Unfortunately they are surrounded by the ruins of a resort complex, which in turn is surrounded by hydroelectric projects (both completed and under construction), so the whole thing together is rather underwhelming. The abandoned buildings of the resort are rather interesting, if you find postwar relics interesting. I was particularly fascinated by the ruins of the resort’s Cyber Café, a thing I think of as thoroughly modern but which has now existed long enough to be established, destroyed in a rebellion, and partially reclaimed by nature. Boali Falls is the only tourist attraction I could find in the Bangui area before my arrival. A picture of the Cyber Café entrance, taken through the slats of a boarded up window in the abandoned luxury hotel at Boali Falls. A gas station on the main road near Boali Falls. 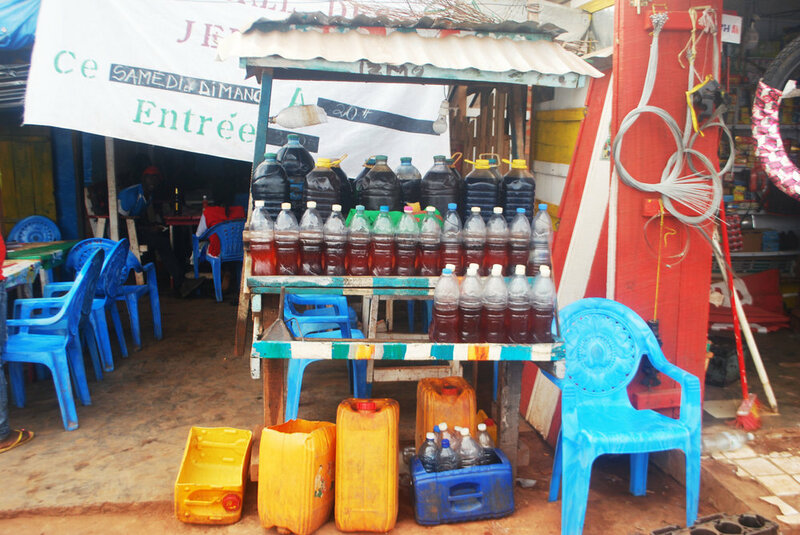 Gasoline is purchased in Bangui, driven up the highway in gas canisters, and partitioned into minuscule amounts in water bottles for sale to those unlucky enough to run out of fuel before reaching Bangui. The entrance to the restaurant where we had lunch is visible on the left. The highlight of my daytrip to Boali was actually the side-trip we took. While driving to Boali I saw I sign at a turn-off advertising “Lac des Crocodiles, 10km” and I was very pleased we were able to visit the lake on our way back. At the turn-off, our driver Nestor pulled the car over and William negotiated the purchase of a live chicken, which was then bound and placed under the glovebox. When we arrived at the lake, we were greeted by a small visitor’s center painted with beautiful murals, and a young man eager to feed our chicken to the crocodiles. 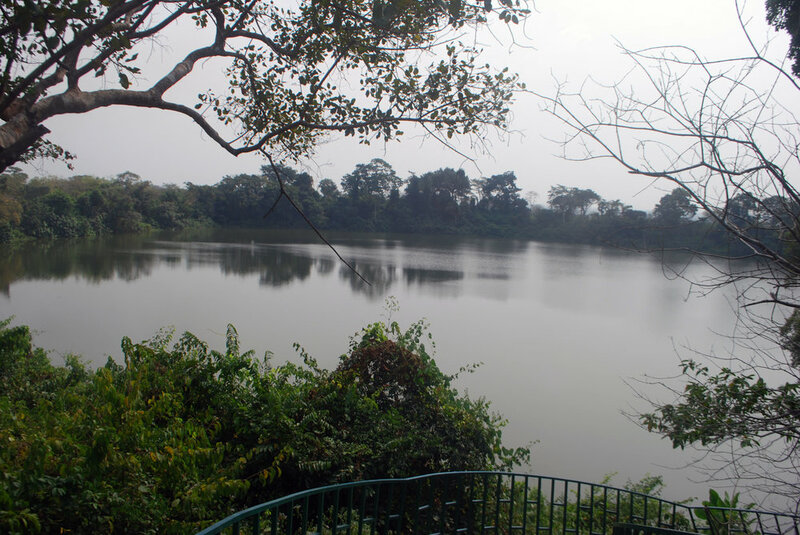 He stood on a platform over the edge of the lake and dangled the chicken by its feet, luring a small sacred crocodile (Crocodilus suchus) out of the water. Fortunately for the chicken, before we could get to the “crocodile lunch” part of the tour, we were attacked by bees. Yes, bees. At first all I noticed were bugs landing and crawling through my hair. Then I started to get stung, on the head, face, hands, camera (that last one didn’t hurt quite as much), and we took off running through along a path through the forest. The path led to a little campsite, where I noticed an odd contraption on the firepit. I asked William about it and he started explaining how the contraption is used to distill a local liquor, until the bees found us again and we had to flee. It was a short tour but I was immensely pleased to have seen the wild crocodile, and secretly also pleased the chicken got to keep its head. 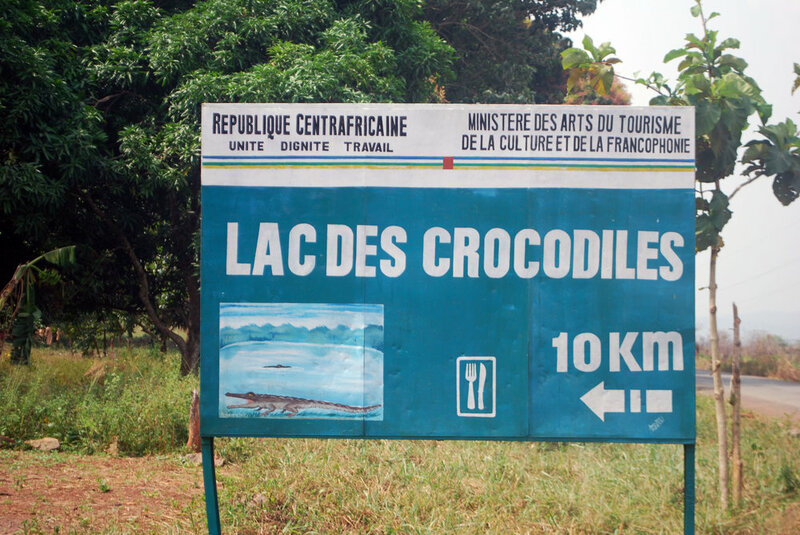 The sign indicating the turn-off to Lac des Crocodiles. ...and one of its namesake residents. This odd contraption on top of a fire pit turned out to be for distilling liquor. The ten kilometres between the main road and Lac des Crocodiles are spectacular in their own right. The road is one of the few places where a habitat known as Forest-Savannah Mosaic is relatively accessible in central Africa. I took the opportunity to look for birds along this road for a couple of hours after visiting the lake, and returned just to bird here, without visiting the lake or Boali Falls, after my time at Sangha. The bird diversity here is quite different from that further south and west in CAR, and my hosts at Sangha Lodge said that other birders had reported that this location is an excellent place to find bird species unique to drier central African habitats. I would highly recommend a trip out here for any birders lucky enough to visit Bangui. A recently burnt part of the Forest-Savanna Mosaic on the way to Lac des Crocodiles. Not all of it was burnt, but the grass was too high in the unburnt parts for me to get a decent picture. When I returned to Bangui that evening, my hosts – employees of the UN peacekeeping mission – asked how my trip was, and I thoroughly enjoyed telling them that we were attacked… by bees. Last week I was in Mason Bay, Stewart Island, New Zealand. The wind was really strong off the ocean and conditions were perfect for vagrants. I was optimistic for some weird penguin or albatross, but what I found was a seagull. At first I thought it was a pacific gull (Larus pacificus) which would have been really cool because according to The Hand Guide to the Birds of New Zealand there's only one record of pacific gull in New Zealand. However, I'm a little confounded because the gull I photographed in Mason Bay does not fit neatly into the Hand Guide's description of a pacific gull. For one, the pacific gull is supposed to have red markings on both the upper and lower mandibles, including extensive red on the lower mandible, and the bird I found only has a small spot of red on the lower mandible. Furthermore, the pacific gull is supposed to have a black subterminal band across its tail, followed by a white terminal band. The gull I photographed doesn't seem to have a terminal white band, or its white band is very narrow, much narrower than the band depicted in the Hand Guide. Finally, the leading edge of the wings of the bird I photographed are white, while the Hand Guide depicts them as black in the pacific gull. So, this bird looks superficially like a pacific gull, but doesn't fit exactly into the field guide's description. I know gulls are tricky to identify, but I'm travelling without access to any additional resources. One thing is for sure, this isn't any of New Zealand's regular gulls. Does anyone know what kind of gull this is? Please let me know. Update: So it's just a black-backed gull, a very common gull in New Zealand. It's tricky, though, because it seems to have retained a few juvenile characteristics, such as the black tail band, into an otherwise adult plumage. Discussion of the bird by New Zealand birding experts can be found here. This gull wasn't the only good find at Mason Bay, we also found this other bird, which we don't need any help identifying. As a wildlife lover, I'm lucky that the places I work are full of wildlife. Throughout my PhD I've been primarily based at the Australian National University (ANU) in Canberra, Australia. Canberra is known as Australia's "bush capital" because of the extensive natural areas that penetrate the urban environment here. As Canberra was a planned city, it was planned from the beginning to have large tracts of natural forest throughout the city, and so has largely avoided becoming the urban wasteland that has enveloped a lot of cities. I've also spent an extensive amount of time at Macquarie University (MQ) in Sydney. Sydney is older, larger, more densely populated and more ramshackle than Canberra, but still has managed to maintain an impressive amount of green space for a city of its size. Both MQ and ANU have benefitted from these efforts to maintain urban green spaces as they are both directly connected to extensive natural areas. The ANU butts up against the Australian National Botanic Gardens and Black Mountain Nature Park, a large area of dry sclerophyll forest. MQ is adjacent to Lane Cove National Park, a long, narrow national park running through northern Sydney that protects the banks of Lane Cove River and consists mostly of wet eucalypt forest. In addition, both universities are making concerted efforts to be eco-friendly and both have characteristics that help attract wildlife: streams running through them, including wetland habitat,patches of forest, and artificial habitat-enhancers, such as nesting boxes for possums. 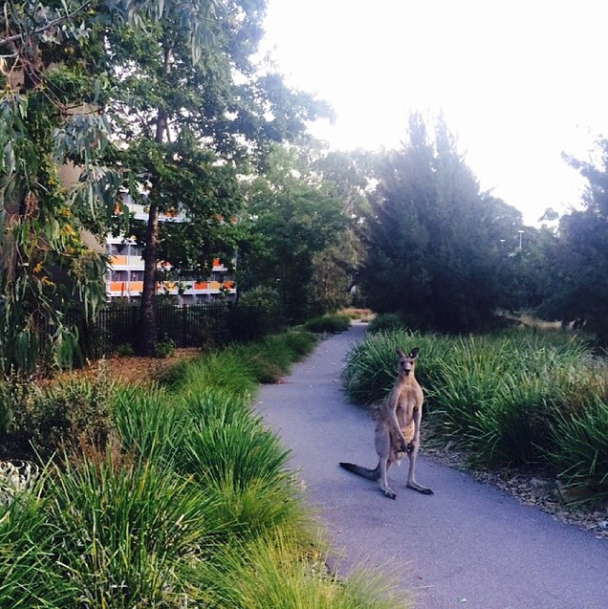 Both ANU and MQ take great pride in promoting the native wildlife that can be found on campus. 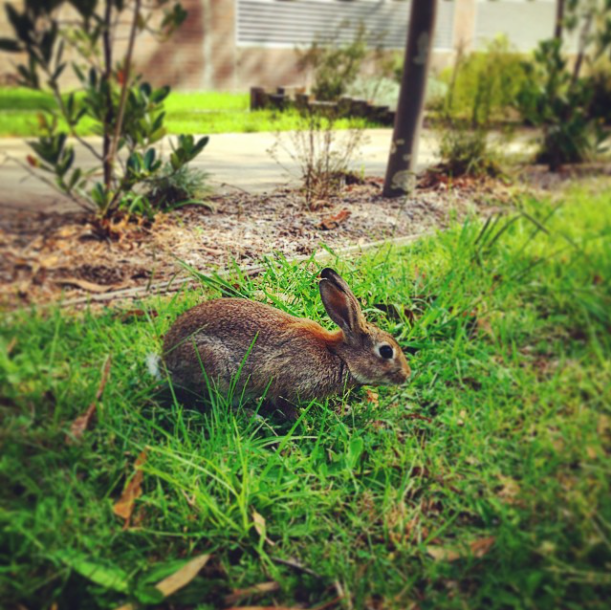 MQ has posted on its website a list of wildlife known to live on or visit the campus. ANU, to my knowledge, does not have such a list on its website, but did post this article about the wildlife that can be found there. I e-mailed the author of that article and she courteously sent me a list of the animals known to live on or visit ANU. The lists aren't compiled in the same way. The ANU list is based off of systematic surveys of the ANU campus and surrounding area done by a campus group called ANUgreen. ANUgreen uses consistent and repeatable survey techniques - different kinds for each vertebrate group - and conducts surveys regularly. The MQ list, on the other hand, seems to be more haphazardly put together, the result of asking enthusiastic wildlife observers on campus what they've seen. However, MQ is apparently in the process of designing more rigorous survey methods similar to those in place at ANU. Since ANU and MQ are quite close to each other, by Australian geographical standards anyway, the lists have a lot of the same species. And since I've spent a lot of time on both campuses and like to watch wildlife, I wanted to see how my own observations at ANU and MQ stack up against the "official" lists. These echidna (L) and eastern grey kangaroo (R) pictures are from the ANU Instagram page, which posts many great pictures of wildlife on campus. ANU's mammal list is short but it's got some cool stuff in it. The macropods, the eastern grey kangaroo and swamp wallaby, are both common just over the road on Black Mountain. Neither lives on the ANU campus, but both make regular visits. I've never come across swamp wallabies on campus, but I've seen quite a few across the road at the botanic gardens. I've seen a few eastern grey kangaroos on campus, though, including one standing patiently at a campus bus station. Echidnas also don't live on campus but are common on Black Mountain and make regular campus visits. In fact, I can't think of a place on mainland Australia where wild echidnas are more common than Black Mountain. If visitors at ANU mention that they want to see an echidna, Black Mountain is where we send them. Sometimes it takes a few morning hikes, but it seems everyone comes across one eventually. Adorable ringtail (L) and brushtail (R) possums live on ANU campus. ANU encourages them by provided artificial nesting boxes (R). 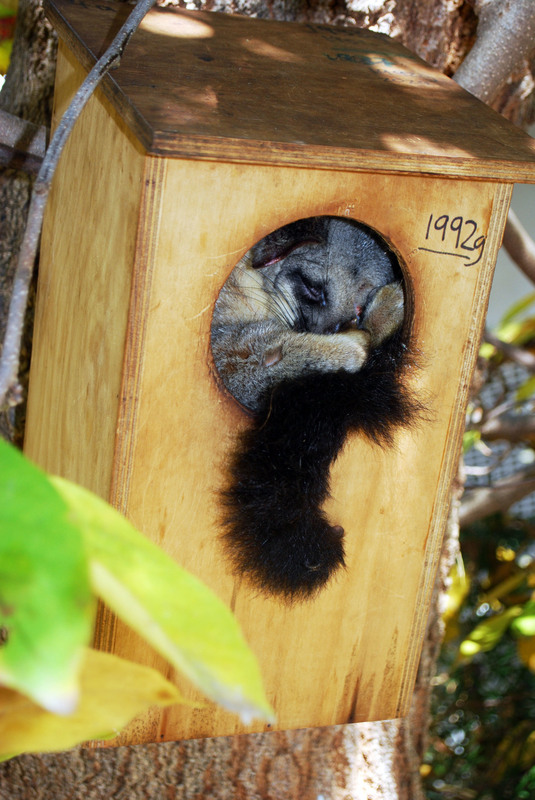 As opposed to macropods and monotremes, common ringtail possums and common brushtail possums are resident on campus. In fact, they are so common here that when a research group needs some subjects for their possum-diet-preference studies, they don't need to go off campus to get the number of animals necessary for their experiments. After the experiment is over, the possums are released back into their on-campus territories. Artificial possum boxes around campus provide convenient daytime resting spots, and whenever it's dark by the time I head home (which is, depressingly, almost all nights) I see at least one brushtail possum along the way. 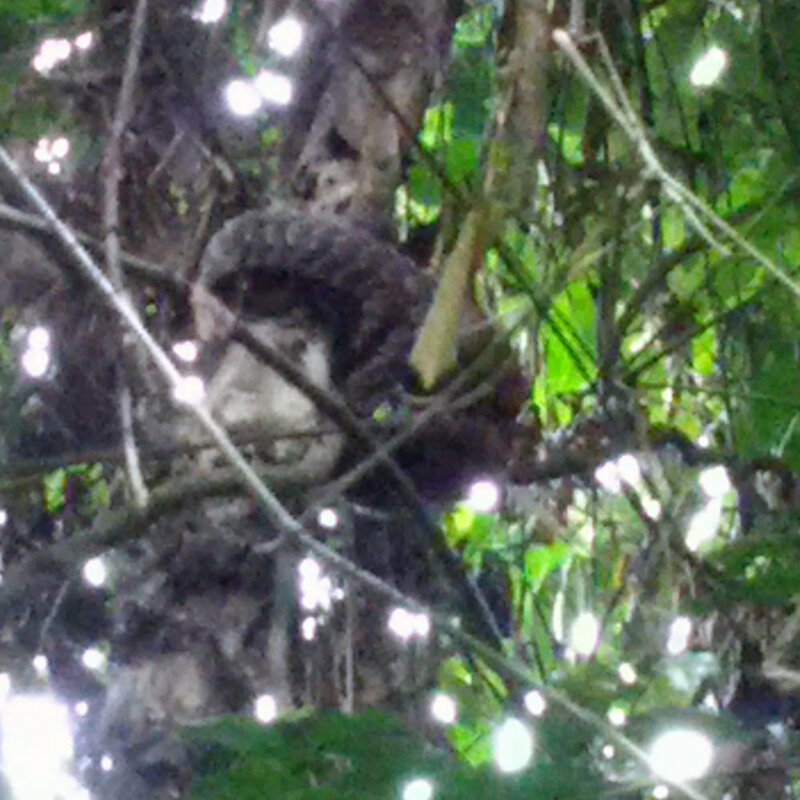 Ringtail possums are not as easy to see as brushtails, but are still common. We had a pair of ringtails take up residence in a banksia tree beside the biology building and while they were living there we saw them almost every day. Unfortunately for us they seem to have moved on. The same banksia that hosted our pair of ringtail possums also attracts grey-headed flying-foxes when it's flowering. There's a balcony at the height of the banksia's canopy from which you can get really good eye-level looks at the adorable flying-foxes as they feed on banksia nectar. White-striped mastiff bats are on the list likely because their echolocation call is audible to the naked human ear, making them much easier to identify than other species of insectivorous bat. There's almost certainly a wider diversity of bats at ANU than is currently represented by this list, we just need to get someone in to do a proper bat-detection survey. Some animals on the list I find suspicious. There are no wombat populations close-by and one would have to wander quite far, and survive several perilous road crossings, to get here. I've also heard that the wombat records for ANU are the result of incidental reports, not evidence having been detected during an official survey by trained individuals. Seeing as their burrows and scats are rather distinctive, if there were wombats living in or around ANU I would think they'd be pretty readily detected. But I could be wrong. I also thought the platypus seemed suspicious, but I'm inclined to believe the Australian Platypus Conservancy and not only because I like the idea of my home university holding the title of the only university in the world that's home to platypus. European rabbits (L) and domestic cats (R) are unfortunately common across Australia, including on university campuses. The rabbit picture comes from MQ's Instagram page, while the cat picture (the only picture I have of a feral cat in Australia) was taken by Angus Kennedy in 2011 during fieldwork in South Australia. ANU is unfortunately home to invasive mammals as well as the wonderful native ones. We have European rabbits here in plague proportions, as well as the much-maligned invasive predators, cats and foxes. I'm surprised cats are on the ANU's list but foxes are not because I see more foxes on campus than cats. I'm also surprised at the absence of black rats (Rattus rattus) on ANU's list. Though I've never personally seen one, I have seen evidence of them - in the form of their droppings - including in my office! MQ doesn't yet have a mammal list. The only wild mammals I've seen at MQ are grey-headed flying foxes, though I did see a road-killed common ringtail possum just across the street from MQ and I've heard reliable reports of black rats on their campus, too! These bird lists are long! Bird lists are always long. ANU's list is 90 birds long while MQ's is 60. Bird lists for any area are almost always longer than mammal and herp lists for several reasons. Birds are often genuinely the most diverse vertebrate group, especially in human-disturbed environments to which birds, in general, are better at adapting than mammals or herps. Furthermore, birds are easier to detect than mammals and reptiles, and often a single survey technique is sufficient to detect the vast majority of bird species, if they are present. In contrast, several different survey techniques are necessary to get at the full range of mammals and herps. In ANU's case, their survey methods for mammals and reptiles are limited and unlikely to detect the full diversity of species present, while their bird and frog surveys are more thorough. Despite the length of the lists, ANU's and MQ's bird diversities are definitely underestimated. On their website, MQ has two bird lists: one of birds seen regularly on campus, and a second list for old records or unusual vagrants that were probably lost individuals. Since MQ's list is based on the observations of local bird enthusiasts, the number of unusual bird records is likely to be very high because bird enthusiasts tend to go out of their way to find unusual birds. I'm deliberately ignoring MQ's rare bird list to make their list more comparable to ANU's bird list, which is based on annual systematic surveys at a set of standardised locations. Therefore, ANU's list is more likely to represent accurately the common birds of the ANU campus and underrepresent the vagrants and unusual cases. ANU's campus is home to some spectacular parrots, such as gang-gang cockatoos (L) and crimson rosellas (R). Both lists show that the campuses are rich in certain groups of birds, mostly parrots, water birds and bush birds, and surprisingly lacking in other bird groups, namely birds of prey and grassland birds. Australia is known as the land of the parrots, and they are very conspicuous on both campuses. The common large cockatoos of eastern Australia, galahs, sulfur-crested cockatoos, and little corellas, are present in large numbers on both campuses (corellas somewhat less so than the other two). In addition, both campuses are lucky to have two of the most spectacular common birds I've ever seen: crimson rosellas and king parrots. Both species are more common at ANU (I've seen over 20 king parrots and 10 crimson rosellas at ANU today and it's barely past lunch time) but they're present on both campuses. In addition to these common species, some additional parrot species are around in smaller numbers: eastern rosellas, musk & rainbow lorikeets (at MQ only), red-rumped parrots (ANU only), gang-gang cockatoos (ANU only) and yellow-tailed black-cockatoos. By far my favourite parrot is the gang-gang cockatoo, it's a real charmer among birds. ANU campus has quite a few resident gang-gangs and I frequently hear their distinctive "creaky door" call while working at my desk. The tree outside my office window has allowed me to watch most of these parrots species, including gang-gangs, feed while I work (which, I must admit, has a negative impact on my productivity). We are very lucky to live and work in a country with such an amazing diversity, and amazing abundance, of charismatic parrots. Wetlands at both universities provide habitat for numerous water-associated species like wood ducks (L). The wetlands area at MQ (R) is big but has a "lawn problem". Left photo provided by Cat Young. Both ANU and MQ have creeks running through them: Sullivan's Creek at ANU and Kikkiya & Mars Creeks at MQ. Unfortunately, all three creeks are subject to hard banking along a significant portion of their length. Hard banking prevents natural habitats from existing along the banks of the creeks and therefore creates a relative wasteland for waterbirds. Fortunately, both Mars Creek at MQ and Sullivan's Creek at ANU have areas without hard banking where wetlands have been established (either naturally or actively by the universities, I'm not sure). In these areas a great diversity and abundance of waterbirds can be found. The most common waterbird on both campuses is the australasian coot, as it is on just about every waterway I've visited in Australia. However, the most commonly seen waterbird on both campuses is probably the wood duck, less because wood ducks are particularly common (they are not) but more because they spend little time in and around the water and more time grazing on grassy lawns where they're more likely to be noticed around campus. Wood ducks are something of an icon on campus and every year I enjoy watching new ducklings appear in the spring and grow up as the seasons progress. Turns out the official ANU and MQ Instagram page-managers also enjoy this, as both pages post more wood duck pictures than any other animal. There's even a Facebook page devoted to the wood ducks of ANU! A wide variety of other duck species, as well as black swans (ANU only), australasian darters (ANU only), a variety of cormorants, dusky moorhens and purple swamphens are also seen around campus. White ibis, famous in Sydney for eating trash, are common at MQ but absent from ANU. Strangely, white-faced heron, a bird common at ANU, is not on their official list. Laughing kookaburras (L) are very tame at MQ and will steal your lunch if you're not careful. MQ also has a good patch of forest (R) but it's mostly off-limits to birdwatchers. Bush birds, or birds that live in wooded areas, are also quite well represented. Both campuses have lots of large trees, including some small patches of forest, and are well-connected to larger forest patches, so it perhaps isn't that surprising that there are a lot of bush birds around. Probably the most noticeable bush bird on both campuses is the noisy miner, that obnoxious honeyeater that dominates urban green spaces and chases off just about all the other birds. Despite the miners, both campuses also have a decent variety of other honeyeaters such as red wattlebirds, yellow-faced honeyeaters, and eastern spinebills. Superb fairy-wrens are common on both campuses, and I've even seen them wander into the biology building at ANU. I've only seen laughing kookaburras at MQ, where they'll steal fries off your plate when you're not looking, but I've also seen them just across the road from ANU at the botanic gardens. Grey butcherbirds are common at MQ, and they too will steal your food off your plate, while pied currawongs are much more common at ANU. ANU in general has a more extensive bush bird list. I suspect this may have to do with the best area of forest left at MQ being a little off the beaten path and mostly protected from bird watchers by fencing, preventing the true diversity of bush birds at MQ from being recorded. This pacific baza seen at MQ is so adorable I just had to post two pictures of it. It kept its eye on me! Both lists are lacking in birds of prey, which is somewhat surprising. Wedge-tailed eagles are common in Canberra and white-bellied sea-eagles are common in Sydney. Surely they should be seen soaring above ANU and MQ respectively every once in a while? To be fair, MQ has several birds of prey on its rare birds list, but I'm still surprised they aren't more regularly seen. One bird of prey that is regularly seen at MQ is the pacific baza. MQ is where I saw my first ever pacific baza and it continues to turn up regularly in the same spot. I think it might live in MQ's fenced-off forest area, or in Lane Cove National Park. ANU's raptor list is only three species: peregrine falcon, Australian hobby and grey goshawk. There is a resident pair of peregrine falcons in downtown Canberra and I've seen them hunting on ANU campus before, so that doesn't surprise me. Australian hobbies are around, but they aren't common, so it's reasonable that they're on the list but surprising that they aren't accompanied by more common raptor species. Grey goshawk is a real oddity, though. They are in Canberra, but they're very rare here. I've never seen one anywhere in Canberra, nor have I ever met anyone who claims to have seen one in Canberra. That it would have been seen on ANU campus while more common Canberra raptors such as brown goshawk, collared sparrowhawk, black-shouldered kite, whistling kite, swamp harrier, and brown falcon have yet to be seen is a huge coincidence. It's even more surprising since grey goshawk is much more common in Sydney, and I've seen them in Lane Cove National Park, spitting distance from MQ (whose list they're not on). I have a sneaky suspicion whoever wrote the list meant brown goshawk. I have to admit, though, that I don't think I've ever seen a raptor on ANU campus, though I've seen collared sparrowhawk just over the road in the botanic gardens carpark. Both lists are also lacking in nocturnal birds and grassland birds, but that is less surprising. Nocturnal birds are not usually detected using normal bird survey methods. Barn owls are common in Canberra, and I saw one once outside my window while I was working late at ANU, but that's the extent of my nocturnal bird observations on campus. The lack of grassland birds might be initially surprising, seeing as both campuses have large grassy areas, but these areas are heavily managed, including keeping the grass really short. This prevents the establishment of the sort of wild grassland habitat the birds need (I call this the "lawn problem"). MQ's rare bird list indicates that several grassland bird species, such as king quail and both species of songlark, used to be present but no longer are. It's interesting that universities seem to see the benefit trees and wetlands have but still like to keep their grass uselessly short, even in areas where it's really unnecessary. 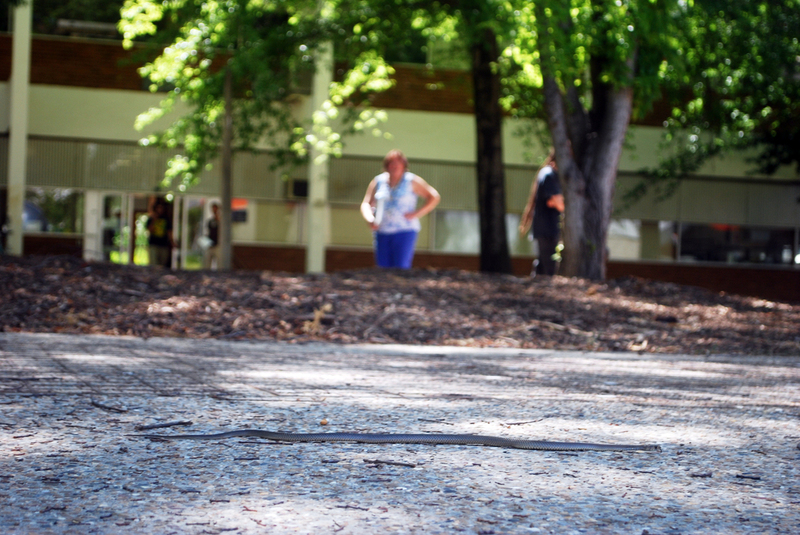 Eastern brown snakes live on ANU's campus. A young one passed by the biology building last year (L) and another individual was seen around the maths department (R). The right photo was provided by Kate Umbers. MQ's reptile list is over twice as long as ANU's. I think this is a problem of search effort rather than a real difference, although Sydney does have a wider diversity of reptiles compared to Canberra. ANU's list is based on one two-hour search period in some "likely habitat" whereas MQ's list is from an experienced herpetologist's observations over four years. I suspect the ANU surveyor's "likely habitat" choices did not included habitat likely to hold snake-necked turtles or fence skinks (though the latter are rare in Canberra and unlikely on ANU's campus). A more sustained effort at ANU would certainly turn up additional species, and I know this because there are several reptile species resident on campus that are not included on the list! This includes the eastern brown snake, which I saw when a young one happened to accidentally stumble into the biology building last year. 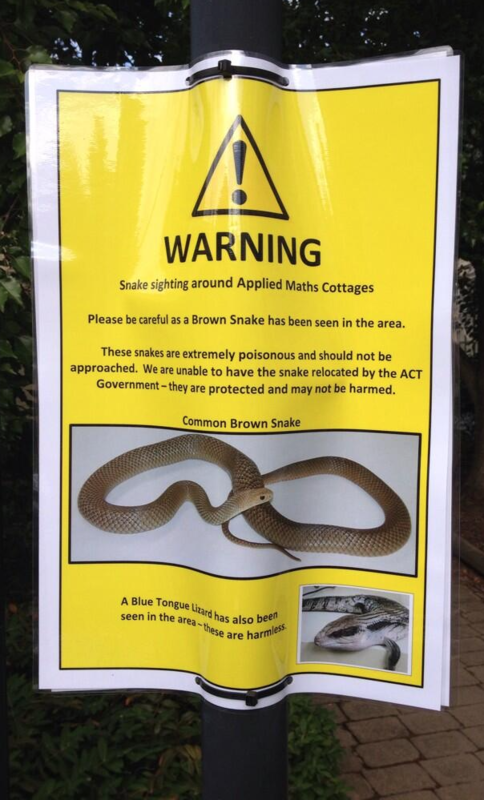 I also know of several other reliable sightings of brown snakes on campus, including a large individual that used to live in the old wallaby paddocks (back when we had wallabies) and another one that seems to live somewhere over by the maths cottages. These two little brown skinks were found on ANU's campus. Can you tell the difference between a garden skink (L) and a three-toed earless skink (R)? Australia has a little brown skink problem. There are way more skink species in Australia than there are all other lizard species combined. The current count of skink species in Australia stands at about 450 (new species are constantly being discovered) whereas there are less than 300 species of lizard in Australia which aren't skinks. Not only are skinks the most diverse lizard group in Australia, they are also the most abundant and most conspicuous. So, like everywhere in Australia, but especially in urban environments, the reptile lists for both ANU and MQ are dominated by skinks. The vast majority of skink species - and therefore the vast majority of lizard species - in Australia are small and brown. Like the little brown bird problem amongst bird watchers, this divides wildlife enthusiasts into two groups: those that throw their hands up in frustration and say they all look alike, and those that look closer to try and find the minute differences in appearance that separate the different species of skink. I belong to the latter category. ANU is home to three species of skink (that we know of), two of which are little and brown: the garden and three-toed earless skinks. However, the common blue-tongued skink is a spectacular large-bodied beast of a skink with a bright blue tongue. I came across a baby blue-tongued skink in the vegetable garden of one of ANU's student residences a couple years back. It was the most adorable baby lizard, but tragically I didn't have my camera with me at the time. The blue-tongue skink is another ANU resident that is not on ANU's official list. MQ has a few more skink species on its list than ANU. The most common species is still the garden skink. I was working in the basement of the biology building at MQ during baby-garden-skink-hatching season, and I kept finding tiny baby skinks on the floor of the basement hallway which I would gently scoop up and move outside. They were so small they could sit comfortably on my thumbnail! I'm guessing that garden skinks lay their eggs in cracks in the old building. When the babies hatch they manage to make it through the cracks into the building, fall to the floor and are trapped.They may also be able to get in if there's a poorly-sealed ground-level window, which basements often have. Eastern water skinks are also abundant at MQ, so abundant that they are collected from campus to use in behavioural experiments at MQ in a similar way to the possums at ANU, and then released once the experiments are complete. Water dragons are common at both MQ and ANU. MQ has the eastern subspecies (L) while ANU has the Gippsland subspecies (R). Wetlands are excellent places to spot herps as well as birds. MQ has at least three species of reptile living around its waterways: the aforementioned eastern water skinks, eastern water dragons, and snake-necked turtles. ANU also has water dragons, but they are the more southern Gippsland subspecies and look substantially different from the eastern water dragons in Sydney. ANU also has two species of turtle: snake-necked and Murray River turtles, even though they're not on ANU's list. Murray River turtles are a relatively new addition to the fauna of Canberra, the first record of one being from 1997. It's unknown whether the population is the result of migration or the release of unwanted pets, but they are now established in Lake Burley Griffin, which is where Sullivan's Creek terminates. Murray River turtles are also breeding in Canberra, including one individual found laying eggs on ANU's campus! Long-necked turtles have always been native to the area and are also found in Sullivan's Creek. This five-legged spotted marsh frog (L) was found on ANU campus by a staff member and brought into the Biology Department to make sure it was okay. This Murray River turtle (R) was found in the act of laying her eggs on ANU campus. The right photo is from the ANU Instagram page. I'm ashamed to say I've never seen a single frog in the wild on either ANU's or MQ's campus. Frogs in Australia are rather secretive, and the best way to find them is by sound, not by sight. ANUgreen does some excellent and thorough frog surveys in collaboration with ACT FrogWatch and has detected seven species of frog on campus, the most diversity of frogs for any location in the city of Canberra! The only frog I've ever seen from ANU campus was a five-legged spotted marsh frog that someone brought in for us frog-geeks to check out. After taking some pictures, we gave it back to the person who brought it in so they could release it back where they found it. MQ's frog list is significantly smaller than ANU's, and this may be because MQ does not, as far as I can tell, conduct systematic frog call surveys on campus. An excellent frogger I know says there's at least one additional species of frog at MQ, the leaf-green tree frog (Litoria phyllochroa). For my part, I've heard frogs on both campuses. I've just never seen one. At the beginning of February, on a camping trip to Wilson's Promontory National Park, I saw a fledgling bird and to this day I have no idea what kind of bird it is. I like birds, and I like to watch them, so while I'm not an expert bird-identifier, I'm no slouch in the department either. However, this young bird has me completely stumped. If you know what kind of bird this is, please let me know! Update: It's a juvenile eastern yellow-robin. Thanks, everyone! Click here for the reason for this blog's existence, and here to find out about the photography presented here. Here is an RSS link for this blog.